Remember: It's not how much you can borrow, it's how much you have to pay back in total' that you must consider. Car Cash Point believes in offering our customers a transparent Logbook Loan. We offer a low rate of interest with no hidden fees, charges or early redemption penalties! Choose your Logbook Lender very carefully and consider all aspects of a Logbook Loan before proceeding. Get the correct Interest RatesOnly choose a lender that makes its profit from their interest charged and not from hidden fees and charges that only come to light after the loan has been completed. Car Cash Point do not impose any hidden fees or charges, our loans are refreshingly simple and transparent. Other Logbook Loan Lenders will offer customers a low interest rate, only to recoup the lost profit post completion. The most common penalty these lenders charge is 'Discount for early settlement'. When a customer wishes to settle their loan early, the Lender will charge the full term of interest and only offer the customer a nominal interest rebate for early settlement. Ultimately, the customer is paying more interest for early settlement. In addition the same lenders seek to penalise their customers if they fall into financial difficulty or make late payments with unjustifiable charge for text's, phone calls or letters for late payments. Do I need to have a Credit Check?If the borrower want their Logbook Loan application to remain private, do not choose a Lender that requires a credit check. If the borrower select a lender that completes a credit check, the search will remain on your credit file for years to come. Remember all future lenders will be able to view this search and the search may adversely affect the borrower's credit score and credit file. Car Cash Point does not require a full credit check. They will require evidence for income and affordability prior to loan completion. Make sure there are no hidden fees and charges?It's all in the fine print, borrower please beware before the loan is completed.The borrower should ask the Logbook Loan Lender during the initial application about the fees and charges that are applicable should a late payment happen or the borrower experiences financial difficulties. The quality mark of a good lender is how they treat a customer if they need help, not when they initially borrow the loan. The only exactable fee that any Lender can charge is a late payment fee of between £6 and £15. Under no circumstances is any fee for make phone calls or issuing letters acceptable and borrows should not use these type of lenders. 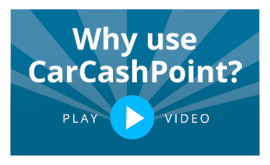 Car Cash Point cap their fees at £6 per weekly payment and £15 per monthly payment and the fees only become applicable 4 days after the payment become due, therefore allowing the customers to catch up without penalty. Are there penalties for settling the loan early?Why should the borrower be penalised for settling your loan early? Car Cash Point is the only UK Logbook Loan lender that allows its customers to settle at any time 100% penalty free, even after 1 day. Car Cash Point in essence offers a 'pay as you go' interest model and actively encourage the borrower to settle early and only pay interest for the amount borrowed and the time the loan is held. Some Logbook Loan Lenders illegally impose a 3 months minimum period to hold the loan before you can even consider early redemptions. Even worse, all other lenders will advise customers upon a request for early settlement that they can offer a 'discount for settling early'. What these Lenders really mean is they will charge the customer the full term of interest and offer a small discount for the early settlement. The final figure then due by the customer will often be significantly higher than the amount initially borrowed. This is therefore a penalty for settling early. The borrower should ask the Lender when they are reviewing the quotation to provide a settlement figure for fixed period after the loan has been completed. This is the only true way to work out the cost of borrowing. It will enable the customer to make a true and accurate Lender vs rate comparison. Can I make overpayments and will it reduce the amount I paid?Yes, all Logbook Loan lenders will accept overpayment against the original loan amount. However, Car Cash Point is the only lender to take the overpayment off the original loan amount and only charge future interest of the reduced balance. Plus, Car Cash Point has no restriction on the number of times you can make overpayments and benefit from reduced interest. Car Cash Point actively encourage its borrowers to make overpayments and benefit from reduced interest payments. This exclusive process will save the borrow £000's. All other Lenders will just take the customers money and offer no customer benefit! Can I pay weekly or MonthlyThe borrower should only select a lender that allows them to choose a weekly or monthly payment option to allow the loan repayments match the way their income is received. The borrower must not accept a repayment term that will put them in difficulty with making the loan repayments. This is when unscrupulous lenders will pounce upon the borrower with their unjustifiable fees. Car Cash Point is the only UK Lender that offers the customer both weekly or monthly repayment options and allows the customer to choose which option best suits their financial circumstances. Borrowers should consider very careful all aspects of a Logbook Loan before accepting a loan. Remember: It's not how much you can borrow, it's how much you have to pay back in total' that you must consider.